Each of the routes has cue sheets and 2 maps. The cue sheet for each route is on the first map PDF. Please print both maps for each route. The coop guide is a 1/2 page sized booklet that contains descriptions of each of the coops, addresses, and contact information of the coop owners. Print out the PDF for your own coop guide. 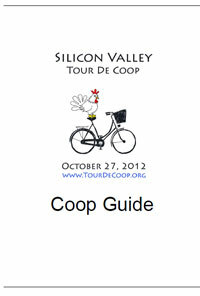 There is one Coop Guide that describes all of the 11 coops, addresses, and coopster contact information (Palo Alto, Los Altos and Los Altos Hills) Tour De Coop – Coop Guide.